Here in the Twin Cities, we’ve gotten our first snowfall that’s going to stick around for a while. 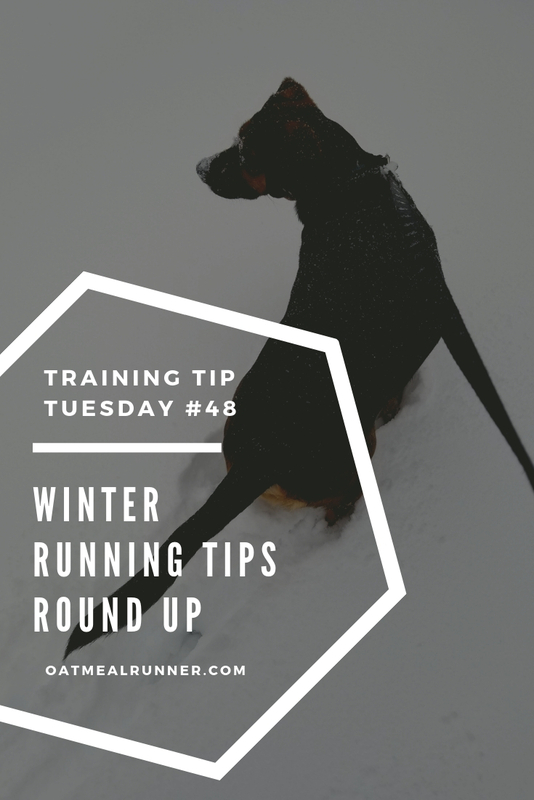 So, it’s the perfect time to do a quick round-up of winter running tips that I’ve shared here on Oatmeal Runner! As much as I love trail running, it feels like it takes a lot more to stay safe than when hitting the pavement. It’s a different beast being out in what seems like the wild (even though most of my trail running has been not too far from downtown Minneapolis) and tackling uneven paths. Here’s some of the top tips I’ve been using to keep myself safe when having fun on the trails! If you aren’t running with someone else, let people know where you are planning to run. I love using the RoadID app for all my runs since my husband live-track my runs. However, this wouldn’t work if I lost a cell signal so I make sure he knows where I’m running just in case. Instead of keeping your eyes focused on the distance like you do on the roads, pay more attention to your steps while trail running so you see the random root, rock or branch coming up on the path. This helps you avoid stepping in the wrong place and twisting an ankle. Looking for more trail running posts? Check out what I thought after my first trail run and my trail running essentials! Trail running takes a lot more out of your body and I’ve found I need to drink more often and refuel quickly after my run. Unlike road running, you aren’t just covering miles, you are covering twists, turns and rises and dips in elevation which causes an increased heart rate. I carry a handheld with me even if I’m running shorter and I make sure there’s a cooler with a smoothie filled with carbs and protein to drink as soon as I’m done. This is especially important when you are running a new trail that you don’t know the terrain of. Trail running is slower than road running and takes a lot more work to cover distance. Figure out a time you can run comfortably ahead of time so you can focus on that instead of your mileage. Even though we had a blizzard in mid-April, Minnesota is already moving towards summer weather! Which is awesome when I don’t have to wear a coat or layer up to take Vinnie outside but brings a new set of complications when it comes to running. Here are my tips for running safely when the weather gets warm! Even if it’s mostly cloudy in the summer, I make sure to wear sunscreen and a hat or sunglasses if needed. You can never be too careful when it comes to sun protection, especially since a lot of my runs are by water and the sun reflects right off the water. I won a 123FRE set from a recent Runners Love Yoga Challenge and it came with an awesome SPF30 moisturizer. It’s formulated for workouts and I’ve had no problems with my skin feeling greasy or it dripping into my eyes as I sweat. As we get into June, I’ll be transitioning my runs to be earlier in the morning to beat the heat. Especially speedwork days, even during the work week, since those will feel so much better without the heat. You can also run after sunset for less humidity but it will still be warmer than in the early morning. You’ve probably noticed how few dark colored running shirts I have and how little I wear my darker color ones. This helps me stay cooler year-round but is especially nice during the summer. Even if it’s not 80+, darker shirts absorb any sunshine and make me so much warmer. Just make sure to wear that sunscreen too! Drink water early and often throughout the day. I start out the day with 20 ounces, even if I’m heading right out on a run, and keep on sipping it throughout the day. And I make sure to stop at water fountains (once they get turned on) or carry water on my runs. There’s nothing worse than running out of gas in a run because you need water. I especially love my Nuun Vitamins in the morning and Nuun Electrolytes during or right after a workout. 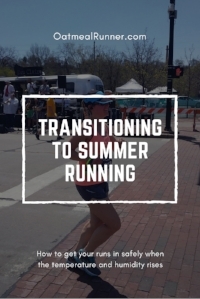 How do you change up your runs in the summer to keep safe? Share it in the comments! It's not a fun thing to think about but it's better to be safe than sorry when it comes to running. Especially when we are doing solo runs or in a new area. Here's a couple of things I do to make myself (and my husband) less worried when I head out on a run. I use the RoadID app on almost every single run so that Mike knows where I am on my run and if he's not home, he knows when I get done with my run. I just set an e-crumb that's sent to him and away I run. One time, it even helped him come rescue me in the car when I got caught in a sudden downpour and had to seek shelter. We've also used it during my longer races so Mike knows where I am when taking photos. It's a lot more reliable than text notifications from the race (if they are offered) plus it doesn't drain my battery too much. Since Mike's planning on biking along the marathon course I'm not sure if we'll use it or not. Every single run I go out on, I put on the brightest clothes possible. It makes me feel more visible to cars (and everyone else around me) plus I won't get too overheated in the summer. I still make sure to triple check when I'm crossing a road or driveway (because some drivers don't) but I feel wearing neon makes me stand out more. And, of course, if it's dark outside I will always put on my headlamp and blinker light. Even though the area I run in by our apartment is lit, I don't trust cars or bikes to see me just by street lamps. It doesn't always work, I did have my headlamp on when I bike going the wrong way down the path almost ran straight into me but that's the only close call I've had. This is probably my biggest tip to everyone, whether you are walking, running or biking outside. Pay attention to what's going on around you. That means you might need to turn down your music and concentrate a little bit less on what's going on in your mind. But there are tons of times where I've seen other people staring at their phone just walk across a street without looking or I've had to dodge people not paying attention and weaving side to side across the path. What are some was you keep safe on your runs?